Are you looking for some clear, concise information for saving money and paying for your trips on ANY budget? Not sure where to cut corners or which decisions to save money could hurt your trip? Are the normal guide books not quite comprehensive enough to give you the advice you want? Then this is what you have been waiting for! 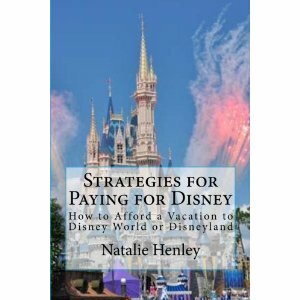 Natalie Henley's Strategies for Paying for Disney is a comprehensive guide filled with a breakdown of what you are paying for, what all the Disney jargon means from tickets to hotels, and even what questions to ask yourself to choose your hotel and package. Not to mention this awesome book is filled with TONS of tips for saving money!!! I knew I loved the book the first time I skimmed through it because Henley gives the same tip that is one of my VERY favorite to give friends and family. Often people see the price of staying on property and think me and my husband are crazy for paying for a hotel on property (let alone a deluxe), they go against my advice and end up staying off property and then wish they had because they enter the Disney bubble and never want to leave. (Oh and they didn't take into account the cost of parking, rental cars, and the extra park time that comes with staying on property.) It is the thorough tips and questions to ask yourself that make this book stand apart. If you are a first timer heading to a Disney park this book is a must read! And if you want more tips and tricks visit Natalie's website: Meet the Magic!